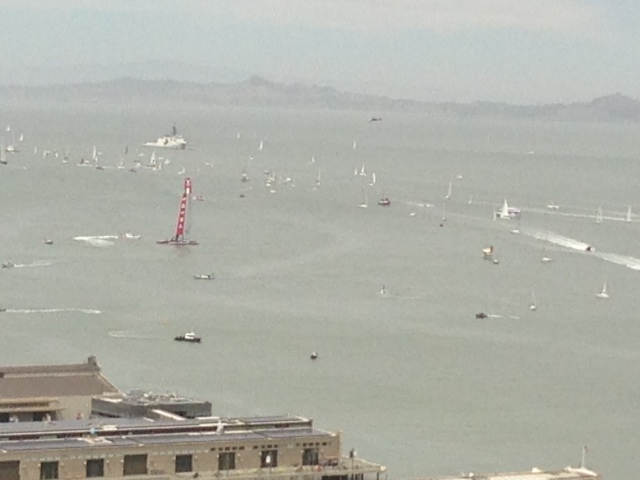 Majestic and graceful the big boats raced across San Francisco Bay again today. Skies were blue and the sun shining and the wind conditions were perfect for two great races of the Louis Vuitton Cup Final. Fans came out under the sunny skies to enjoy the day and a full day of racing. The Italian Luna Rosa and Emirates Team New Zealand rose grandly on their foils as sails caught the wind and the catamarans took off on the course around the spectacular Bay. 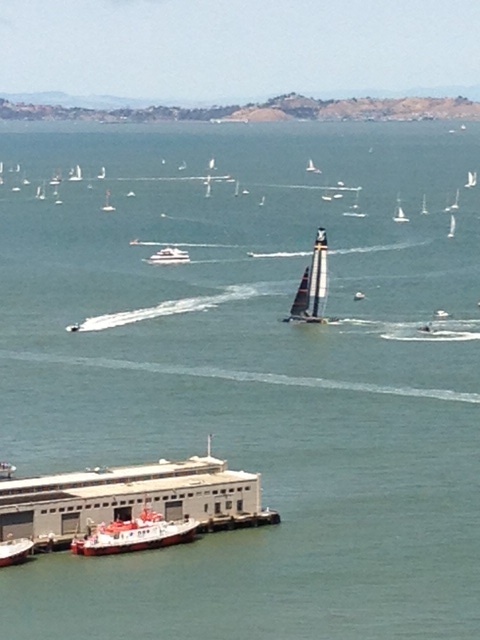 With the backdrop of the beautiful San Francisco waterfront, Alcatraz, Angel Island, the Marin Headlands and the Golden Gate Bridge, could there be a more scenic locale for a boat race? WHAT A DAY ON THE BAY! 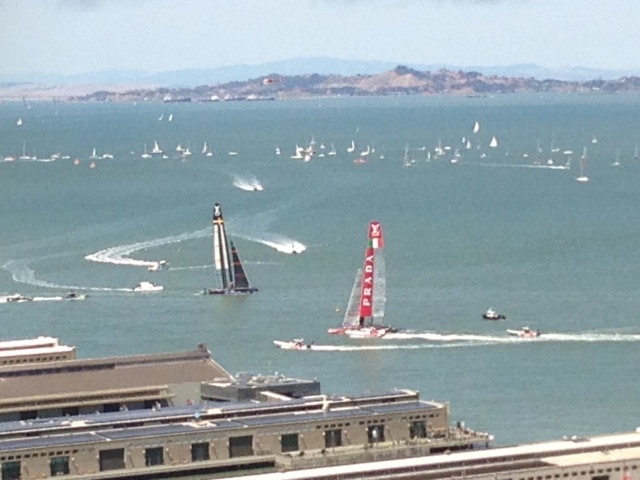 San francisco Bay was alive with excitement yesterday as the big boats came out to race. Under sunny skies sailboats of all sizes were on the water to watch. Ferry boats carried tourists around the waters to view the sight and their were luxury yachts as well. Even a fireboat and Coast Guard boat came out for the fun. People crammed the waterfront to get a view and, as the Oracle boats finished their practice races and headed back to their home dock, the Italian Luna Rosa and the Emirates Team New Zealand appeared to begin the finals of the Louis Vuitton Cup. They are majestic catamarans that glide gracefully through the water at amazing speeds. While everyone was expecting drama and high competition, the racers had to deal with high winds and equipment malfunction and crewmen being dunked in the water. Luna Rosa broke down and could not race and Emirates Team New Zealand went into the water while rounding a turn that sent two crew members splashing into the Bay. They were quickly rescued but the race was over. Today promises to be another day of excitement and racing as the Louis Vuitton Cup Finals continue. The Bay will be alive with boats again and the shoreline and waterfront filled with onlookers. It will be another great day on the Bay – and hopefully a great race! 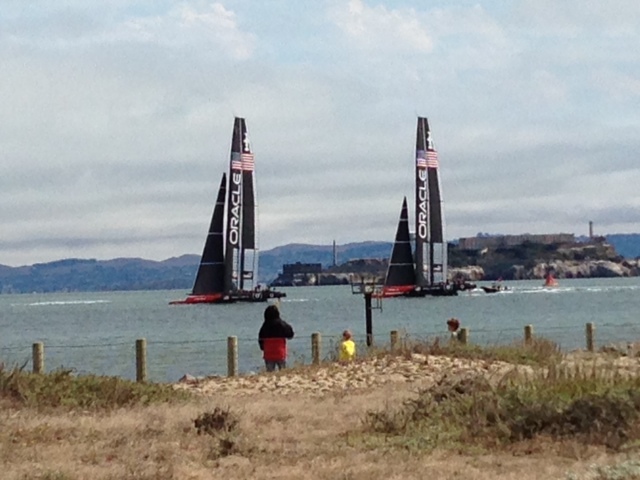 Under the watchful gaze of the Golden Gate Bridge the big boats of the America’s Cup practice. The gray skies turn to blue as the sun begins to shine and the boats continue their sail back and forth and around the Bay. The boats are truly an amazing site as they are so large and move so gracefully and quietly through the water. Tankers, sail boats and ferry boats plow the Bay regularly but the America’s Cup catamarans are a special and exciting site. The waterfront is alive with people watching – from the grassy Crissy Field and its beautiful beach to the Ferry Building and the waterfront promenade. The views of San Francisco Bay are spectacular and, as people go about their days, the big boats add to the beauty. 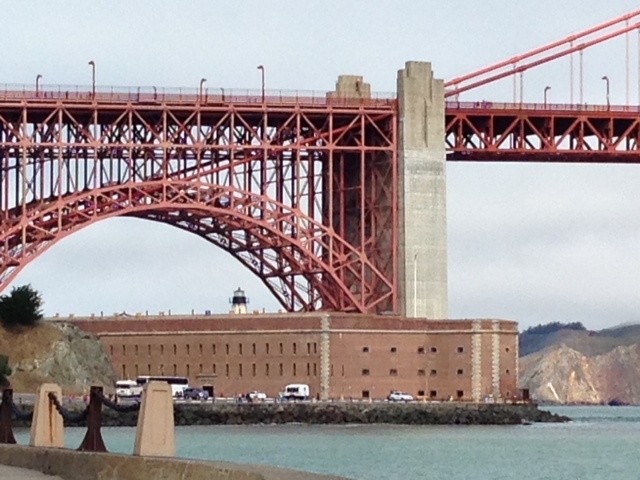 Under the watchful gaze of the Golden Gate Bridge, Fort Point stands at the entrance to San Francisco Bay. Fort Point was built between 1853 and 1861 to protect the Bay. Built during the California Gold Rush and outfitted with over 100 cannon, it never saw battle during the Civil War. Its brick walls are several feet thick and it has been used for storage, training and to guard the mine fields and Golden Gate anti-submarine net during World War II. Today it is a National Historic Site and part of the National Park Service. There are tours given by Park Rangers, fascinating instruction on how to load and use the cannon, a wonderful bookstore, and exhibits of photography depicting the history of the infantry at the Fort, the Buffalo Soldiers and the role of women in the Army. There are also examples of officer and enlisted man quarters. It is a fascinating visit and the views of the Golden Gate and San Francisco Bay are spectacular! Civil War Living History Day is Saturday, August 18th from 10 am – 5 pm. There will be musicians, infantry and artillery drill and daily life of the soldiers during the Civil War era and everyone in authentic costume and uniform. It will be a wonderful look at history and an amazing experience – a perfect day to visit this historic treasure! You are currently browsing the Powerhiking's Blog blog archives for August, 2013.